Remember the artist Momus and his experimental album Stars Forever? No? Well, that's alright. That really isn't the point right now. What should be taken away from this artist is his creative way of approaching merchandise. Momus was tired of all the T-shirts, posters, and whatever generic idea thousands of bands have spit out over the years. Instead, he wanted to create a piece of merchandise that was unique to his fans. For Stars Forever, Momus wrote 30 songs, one for every person who contributed a sum of money to the project. Essentially, he was selling his creativity to fans who, in turn, got a personalized creation to keep forever. Perhaps these songs may have cost fans a few more dollars ($1,000, to be exact) than a T-shirt, but can one really put a price on the beauty of music? Probably, but let's just say no for the sake of art. We can beat around the bush all we want, but smoking and music tend to go together quite well. Because of this, some bands have had success selling products that smokers actually require. Think of it as a band-run convenience store where all the products simultaneously promote the brand. Whether you support smoking or not, there are going to be fans of yours that do. By selling them rolling papers, you're helping them out with something they can actually use. A T-shirt or sticker is great, but does anyone actually need those things? Rolling papers are a fun, useful, and creative way to get your name out there. You don't have to go full Miley Cyrus and give out 24-karat gold rolling papers, but a little effort might pay off. Adults like music too, and they have adult needs besides paying bills and wearing T-shirts. If you really want to be successful at selling merch, it'll help to get deep inside your audience's head. What are they thinking? What did they do before coming here, and most importantly, what will they do after the show? 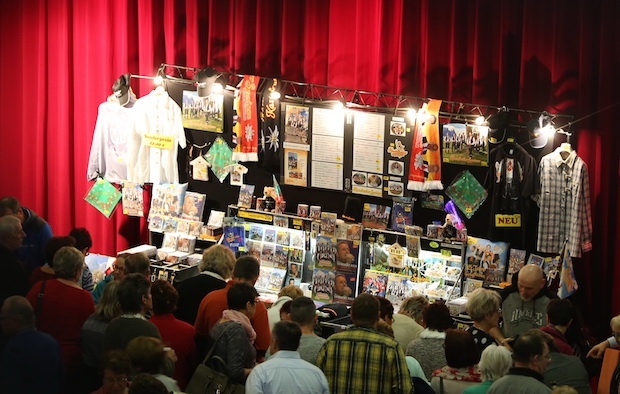 Most likely, adults will go do adult-related activities after the show, which is why you should sell merchandise to help them with those tasks. Tenacious D is one band that got into their fans' heads perhaps a little too well. The result? Tenacious D cumrags. These $12 necessities proved to be a huge hit among "D" heads. Not to say this will have the same effect on your band, but it helps to keep an open mind. After that last point, it's time to clean things up a bit. Believe it or not, concertgoers use soap. They may seem like sweat-drenched, alcohol-infused meat bags at the show, but afterward, they need a way to rid themselves of the grime that tends to accumulate from such an experience. To do this, soap is usually involved. Sure, you could sit back and let those fans use some generic brand of body wash to do the deed, or you could take inspiration from the Raconteurs. Yes, the Raconteurs developed their own soap to sell on their online store. Weird? Definitely. Smart? Most likely. It's time to break the societal boundaries with this one. Our childhood may be years behind us, but that doesn't mean we still can't take part in the pastimes of yonder. Why can't we ride scooters, play in sandboxes, and pick our noses anymore? Apparently, society has put up rules, but we as adults don't have to listen. The band Ween certainly doesn't listen. They understand that the inner child is still within all of us. They understand that we still have the desire to color. Special Ween coloring books are available to purchase, and fans seem to love it. Whether it's the fact that Ween has brought their fans back to a time of nostalgia or their crowd simply likes to color, it seems that the idea was both unique and successful. These are just a handful of strange ideas you can take inspiration from, but don't hold back. Your fans might respond better to creative merchandise ideas than you think.